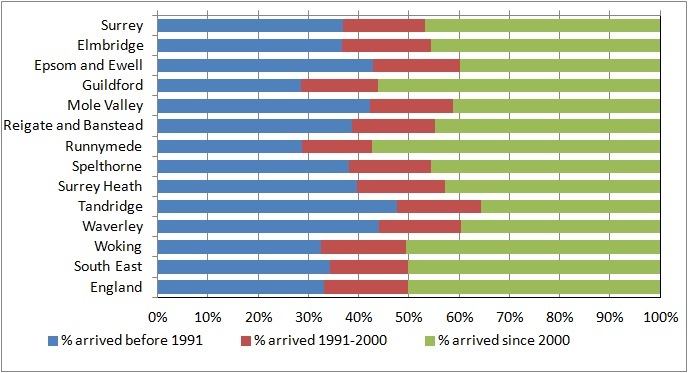 Nearly half (46.7%) of Surrey residents who were born overseas have arrived in the UK since 2000. Surrey has a slightly higher proportion of its population born outside the UK than England as a whole, where 4.4% were born in EU countries and 9.4% elsewhere. The proportion of Surrey residents born outside the UK has increased since 2001 when 10.6% were born outside the UK. 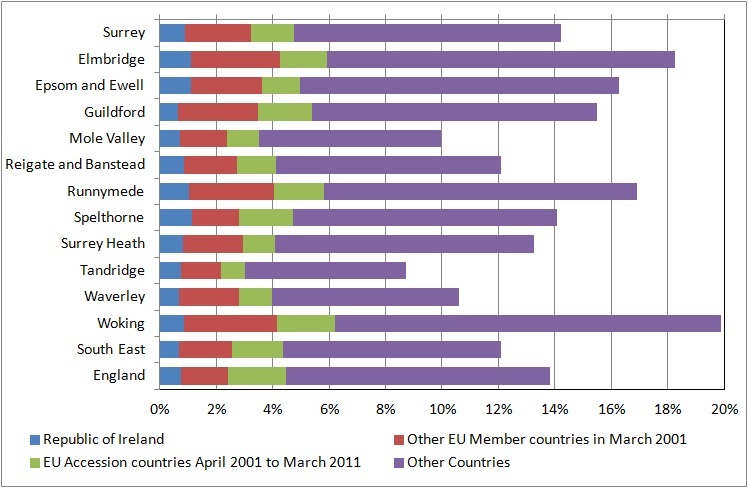 The percentage born in Republic of Ireland and countries in the EU in 2001 remains fairly similar, with the increase coming from other countries. Note that in the 2001 Census, people born in countries which have subsequently joined the EU would have been included in the other category. For the first time, the 2011 Census asked for information about passports held. Some people may hold two or more passports; these may be from non-EU countries, EU countries or a combination of both. Accordingly, the numbers of passports held by the resident population will exceed the number of passport holders. 82.3% of Surrey residents hold a UK passport. Tandridge has the highest proportion of UK passport holders (85.4%) and Runnymede the lowest (78.1%). 9.7% of the population do not have a passport, because they have never held one or their UK passport has expired. Spelthorne has the highest percentage with no passport (11.0%) and Elmbridge the lowest (7.3%). 5.5% of Surrey residents hold a non EU passport. This contrasts with the 9.5% of the population born outside the EU. This suggests that a large proportion of people who were born outside the EU have acquired British or other EU citizenship and hold a British or EU passport. However some people born abroad will be UK citizens because their parents were UK citizens overseas at the time of their birth. 4.7% of the population hold passports from EU countries. This is very close to the 4.8% of the population who were born in the EU. This may be because EU passport holders have rights to free movement and employment in the UK which non-EU nationals do not; thus there may be less need for EU passport holders resident in England and Wales to apply for a UK passport compared to non-EU nationals. Surrey has a higher percentage of its population holding a UK passport than England as a whole. However a smaller percentage has no passport. Overall a higher proportion of Surrey residents (10.2%) hold a non UK passport than England as a whole (8.9%). Figures do not sum to 100% as people may hold two or more passports; thus the numbers of passports held by the resident population will exceed the number of passport holders. For the first time, the 2011 Census asked for the year of arrival in the UK for residents who were born overseas. 46.7% of non UK born Surrey residents arrived in the UK since 2000. Runnymede (57.4%) and Guildford (56.1%) have the highest proportion of recent arrivals which may be due to foreign students studying at Royal Holloway College and the University of Surrey. The lowest proportion of recent arrivals is in Tandridge (35.6%). The proportion of non UK born residents arriving since 2000 in England as a whole is slightly higher at 50.2%.